Paperback, with flaps, 240 pages, 13.5 x 20.6 cm, 5.3 x 8.1 in. Sarah Fischer loves her two-year-old daughter – and yet she regrets ever becoming a mother, for life as a mother still goes hand in hand with many professional and personal restrictions. In this respect it is easier for fathers. Women are forced into their roles as mothers and what could be called self-sacrificing service providers in which personal needs don't count. And if that weren't enough, they are also expected to be happy, for motherhood is fulfilling, and anyone feeling differently is considered egoistic or uncaring. Sarah Fischer is one of the few women to publicly admit to regretting motherhood. 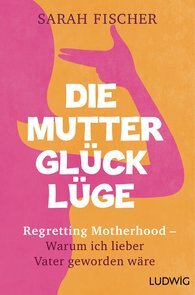 In her brutally honest and at times shocking account, she tells how since her daughter's birth her own self-determined life gradually got lost and why we urgently need a new image of motherhood that is geared to the needs and abilities of women.